Something that Richard said in his post during the week got me thinking about characterisation. This is so true. 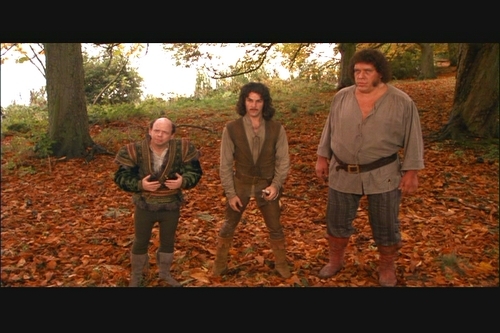 I found myself showing the movie The Princess Bride to my class the other day and when it came to the fight scenes, I said, Now watch closely. The reason these scenes are gripping is because the people stay in character while they fight. When Westly (the man in black) fights each of the three men who have been sent to kidnap the princess, each fight is different, each requires a different skill and he wins in a different way. Inigo believes himself to be such a skilled swordsman he has to fight left-handed, or there is no fun in it for him. When he swaps to his right hand and they continue, the man in black smiles. Why? Because he is not left-handed either. The giant doesn’t think it is very sportsman like to hide behind a boulder and throw rocks. When the man in black knocks the giant out, he says, I do not envy you the headache you will have when you wake. Sleep well and dream of large women. When the man in black comes up against the Sicilian, he defeats him using his wits. 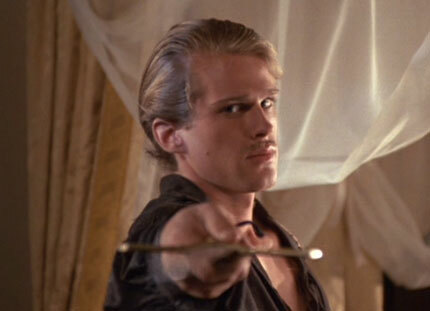 And even in his last battle with the Prince, Westley plays on the Prince’s cowardice to defeat him. You can only write these kind of scenes if you know your characters well enough for them to stay in character while they are fighting. How the characters behave when they interact comes down to the sort of people they are, which is Richard’s point, about characters bouncing off each other. Here is a link to Richard’s tips for Creating Characters in Groups. For his whole section on characterisation see this link. Here’s Holly Lisle’s article on How to Create a Character. She talks about starting with a dramatic need. Another movie which I show the kids to help explain characterisation is Blade Runner. There’s a scene right at the end of the movie where the last replicant (android) talks about his past and comes to terms with his imminent death. He’s just saved the detective from falling off the roof. Now he sits there in the rain and talks of the things that he has seen, which will all die with him. This powerful line wasn’t in the original script. The actor came up with it, which is an achievement considering English was not Rutger Hauer’s first language. In this case you have an actor who knew his character so well, that he knew what the character would say. This is what the writer should be aiming for. The writer needs to become so immersed in the character that they see the world through that character’s Point of View. I wasn’t using PoV in the traditional sense, as in how to switch from one PoV to another in a scene, but more in the sense of filtering the world and its events through the character’s perception. A child character might blame themselves when their parents fight because they’ve been naughty. A character who is inherently distrustful will see ulterior motives where there are none and a character who is honest, will fail to see the dishonesty in others. Sometimes a ‘good’ trait can be a failing in the right circumstance. So there are you are – Characterisation through View Point, the evidence is in the action or reaction of your character/s. What are your favourite movies for characterisation? Did you know that this famous line from Blade Runner was an ad lib on the actor’s part? 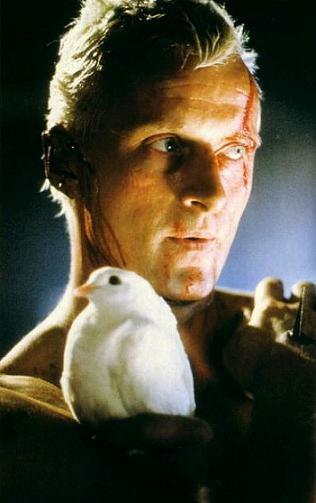 Rutger Hauer knew his character so well, he could trust himself to ‘voice’ the right thing. Here’s a link to watch the scene. This week’s writing craft post is about ‘VOICE’, as in the author’s voice. It is so hard to define. I once asked an editor what they were looking for and they said, they’d know it when they saw it. That’s what authorial voice is like. You know it when you see it. Some writers have a strong voice and it flavours all their writing. Other writers are more like actors and they slip in and out of voices. I don’t consider myself an expert on the topic so I’ve been gathering insights from others. There’s a lot of advice on the web on how to find your voice. Here is a podcast with Julia McCutchen on how to find your authentic voice. Steve Pressfield analyses voice over here. He talks about the role of voice. ‘The writer’s voice casts a spell. The right voice makes the work accessible; it gives us the tone and point of view that best illuminate the material and make it shine. The magic of Hemingway’s prose is that it describes events the way the human eye sees them. He taught himself this technique as a journalist and he used it very consciously and deliberately. The door opened. Brett stood there. Behind her was the count. And here Jayne Pupek analyses the elements of voice. She breaks it into Diction, Syntax, Tone and Dialogue. All of which is fair enough. I like her ‘Dare to be Dreadful’. As children we are encouraged to attempt things, even though it is likely we will fail. In fact, it is expected that we will fail at first, until we gain the skills to succeed. As adults it is much harder to accept failure because we expect to be competant. We have a lot of ourselves invested in success. But being a creative person means you are constantly putting yourself on the line. Failure is always an option. And you never get accustomed to the pain of failure. Each rejection hurts because you put 110% into your work. It seems to me that voice is about trusting yourself and writing from instinct. What do you think?